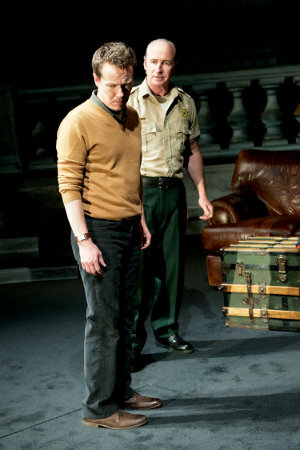 Christopher Liam Moore and Bill Geisslinger in GHOST LIGHT at Oregon Shakespeare Festival; photo by Jenny Graham. In the months leading up to the start of our 2013 Main Stage season, I am once again profiling the creative minds behind our productions. The March installment of the Season Artist Profile features Christopher Liam Moore, a frequent guest artist at Oregon Shakespeare Festival who may be familiar to you as the actor who played Jon in Ghost Light at OSF in 2011 and Berkeley Rep in 2012. The noted director makes his Cal Shakes debut this summer when he helms Lady Windermere’s Fan by Oscar Wilde. What follows is the full transcript of my email interview with Chris. To sign up for our email newsletter, click here. Stefanie Kalem: What are you working on right now? What projects have you done most recently, or do you have coming up? Christopher Liam Moore: I am directing two shows at the Oregon Shakespeare Festival this season. I am currently in rehearsals for A Streetcar Named Desire, which opens on mid-April. I start rehearsals next week for A Midsummer Night’s Dream which opens in mid-June. This winter, I directed Red Herring by Michael Hollinger at Artists Repin Portland. The cast of Moore's 2013 production of RED HERRING at Artists Rep; photo by Owen Carey. SK: Is this your first time directing Wilde? CLM: This will be my first time directing Mr. Wilde. I am thrilled and terrified. SK: What do you like about directing for an outdoor stage? CLM: I love the scale of it. I love that the stars are the roof. I love the intimacy and claustrophobia of a Victorian drawing room juxtaposed against the expansiveness of the hills and trees. SK: How do you think working on our stage will be different from working with the OSF one? CLM: In the Elizabethan Theatre at OSF, there is a massive two-story Tudor facade that is the backdrop for every production. It is a decidedly strong visual presence which can be wonderful and also challenging. I am very much looking forward to having the hills of Orinda lend their magic to Mr. Wilde’s world. I am looking forward to learning the space acoustically as well. SK: Can you share with us any additional early thoughts on this production of Lady Windermere? CLM: We have a tremendous cast. I know we will dive deep and create an emotionally fearless production which honors Mr. Wilde’s wit and sharp insight. Our early design meetings have been exciting. There will be some unexpected choices. SK: Was there a piece of theater you saw when you were younger that made you think, “I want to be a part of this”? Elia Kazan's original Broadway production of A STREETCAR NAMED DESIRE, starring Marlon Brando, Kim Hunter, and Jessica Tandy. CLM: Yes, I saw Midsummer at the American Repertory Theatre in Cambridge, Massachusetts when I was in high school. I had never seen Shakespeare done with such wide-open imagination. SK: What inspires you right now? Any particular theater artist, music, film, television, visual art, politics? SK: And lastly, if you could have directed or acted in any production in history, what would it be? CLM: Right now, I would have loved to be a fly on the wall during the rehearsal process for the original production of Streetcar.